KyungSun in Scotland: Happy Graduation! 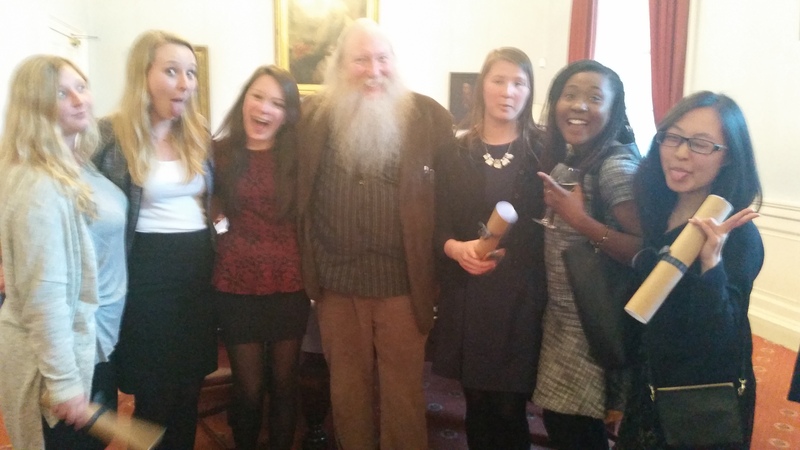 My teacher/Parliamentary program coordinator, Paddy, and the girls from my flat! Last week marked the formal end of my internship. As I reflect on my time at Holyrood, I can’t help but feel an overwhelming mix of joy, accomplishment, and sadness. It takes me back to high school graduation. I remember down the red carpet with my diploma in hand, ready for the next step in my life, but also sad for the people I’d say goodbye to. The difference between then and now is that this time, I won’t be coming back to the same place. Scotland is and has always been the temporary home that my exchange friends, church friends, teachers, and MSPs shared. Now, I will be leaving this home in 6 days. When I first arrived, I came with two main academic goals: to learn about the policy-making process and how Scotland delivers great healthcare through its NHS (National Healthcare System). I was expecting to just see and learn the formal processes in action, but instead learned in a much greater way. 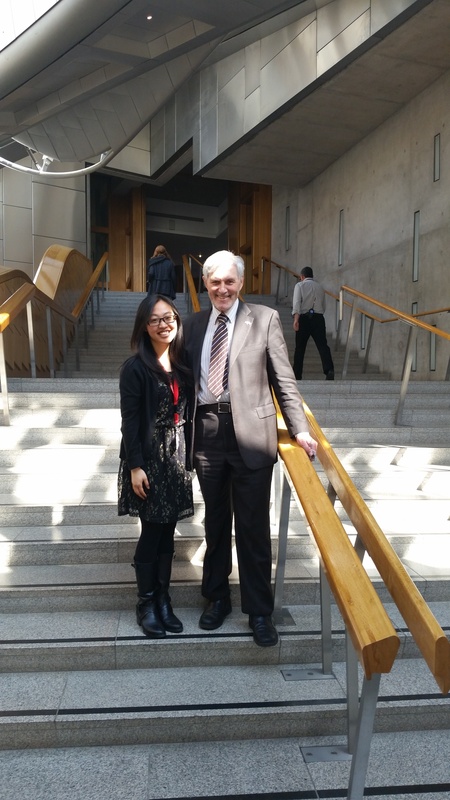 My MSP, Richard, in particular created a very open space for me to learn and grow during my time at Holyrood. I initially was very nervous when I first came in and was immediately asked to write up briefings on research Richard needed. I thought it would be something that he would just skim or put aside for later, but was surprised to find out that he had sent out the reports to other staff members on the project. I was always diligent in my work, but of course I wasn’t perfect. I still had to get used to little things like the different spellings to the bigger things like not always knowing where to look for specific information. But being able to interact and bounce off these topics with Richard made me see how passionate he is about keeping people healthy. Something that struck me was when we were reviewing the percentages of waiting times and Richard, frustrated, had said something like this: “Can you find me a number? I don’t like this report because it gives me a percentage and people are not percentages; they should be counted each as individuals”. I admired this statement; it reflects his dedication to bringing about change for the people he serves, and I’m glad to have been part of making the changes happen. 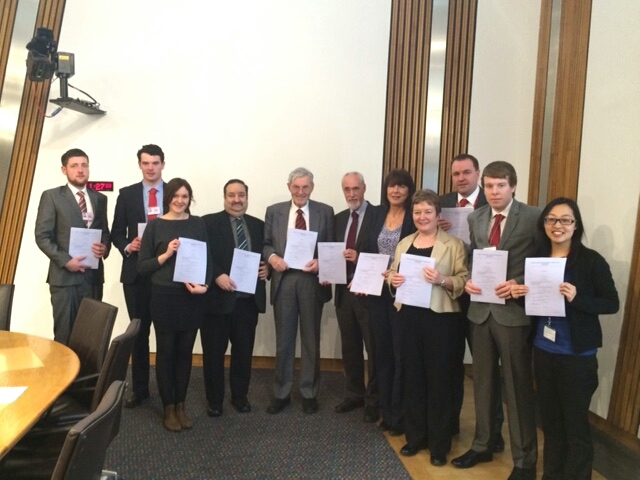 Richard’s Alcohol Bill Launch! One of the things he really pushed for is to reduce the alcohol/tobacco consumption in Scotland. Some of the measures in his bill include things like retailers not being able to sell packs of beer cheaper than if you would buy the same amount as individual cans. The greatest thing I admire about Scottish politics are the incentives built within the political system that enables the MSPs and their staff to focus on the work rather than the position. In Scotland, politicians have a modest spending budget limit for campaigns, which makes the position more accessible to the general public. It was both surprising and amazing when the other interns and I discovered that staff members of MSPs (Member of the Scottish Parliament) were running either as MSPs or as MPs! The other interns and I agreed that we would never see this in the States simply because you need a lot of money to have a good chance in the race. I certainly wish I could bring this feature of politics back with me to the States. It initially didn’t hit me that it was time to say goodbye. I went into work as usual, had lunch with some of the other interns, and went campaigning on my last day as a final gathering with the team. 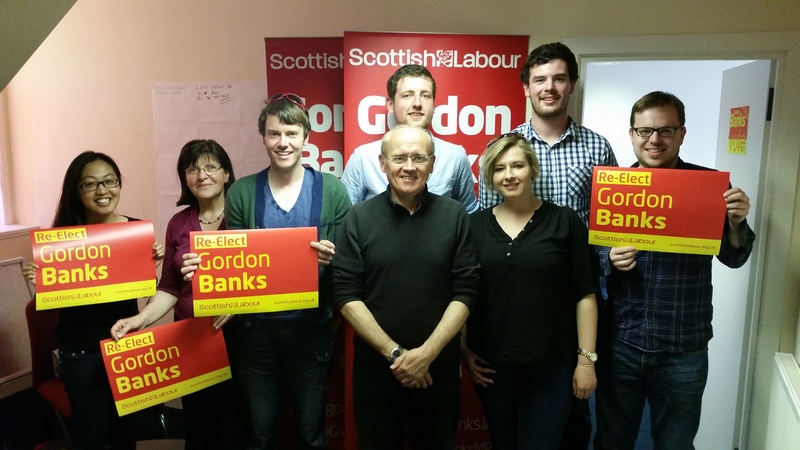 The UK Election is now officially 1 week away and my MSP/staff have been busy campaigning for Gordon Banks, the Labour candidate running for MP (Member of the UK Parliament). I spent a very relaxing, fun day down in the constituency office in Alloa getting to know the other volunteers. I also got to share a car-ride chat with Gordon Banks about his work as an MP. I could see that he is someone who values the individual relationships he has with the community he serves and he told me that if he had the choice, he would choose to work from his constituency rather than spilt his time between London and Alloa. Even on my last day, I was happy to be learning more about the people driving change in Scotland/UK. But all too soon, the day ended, and I hugged everyone goodbye. The Labour campaign team to re-elect Gordon Banks! He has served as an MP for the past 10 years already! 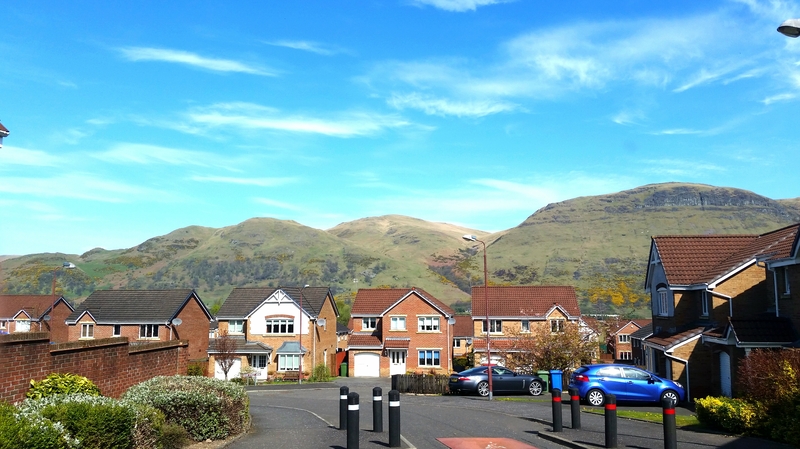 Where we were campaigning: in the quaint town of Alloa. Initially, I had ruled out working in government simply because I saw it as a job that detaches you from the people you serve. But I am now re-considering the possibility of being involved in local or state government someday. I see it as a great incubator for change. I see so many possibilities as I enter my final year at University this upcoming fall. I see a long road of detours and discovery. But most of all, I see hope that I, although one person, can be a force of change. With my Parliamentary Program diploma in hand, final research report submitted, and thank you cards given to the people who’ve given me this wonderful opportunity, the next and last thing to do is somehow begin preparing myself to say goodbye to Scotland and the friends I’ve made here. Till next time! This entry was posted on Thursday, April 30th, 2015 at 3:29 pm and is filed under KyungSun in Scotland, Spring 2015. You can follow any responses to this entry through the RSS 2.0 feed. You can leave a response, or trackback from your own site. 2 Responses to KyungSun in Scotland: Happy Graduation! I’m so glad that you’ve had such a great experience KyungSun and I can tell through your blogs, which help me picture Scotland, especially with the pictures you provide 🙂 I hope you enjoy the rest of your experience there!!! Thank you Sequoia! I cant wait to see you! !